Every thought that has formed within your gorgeous brain was a burst, zap, flash, of energy. 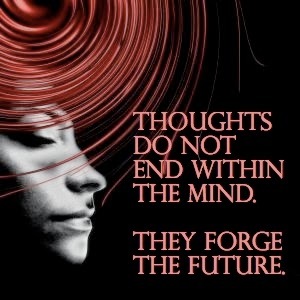 You are able to control the thoughts that you allow space within your brain. Long ago, I didn't believe that I was responsible for the things that I allowed space in my head. A startled friend pointed out that, indeed, my brain is prime real estate, and I have control over the renters. Mind the way your thoughts make you feel. Pay attention. If a memory or a mental note makes you feel funky, spend less time giving it space. Make room for constructive inspiration because your thoughts are the foundation of your future.